As organizations upgrade to faster and more intelligent IT infrastructures and content-aware components, they need to know how each network or device will behave under different loads, throughputs, and security attacks. But an increase or decrease in customer complaints is not the way you want to find out. Neither can this critical knowledge come from equipment manufacturer data sheet specifications, functional testing of the GUI interface, or estimates of how a device will perform under realistic conditions. To select the right products for your specific network, application, and service mix, you’ll need a more comprehensive and methodical way to evaluate the sophisticated high-performance network devices within your infrastructure. 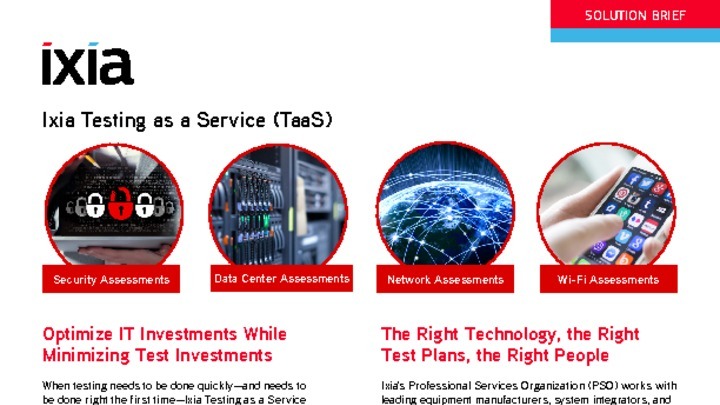 Ixia’s Testing as a Service (TaaS) brings you the hardware, software, and services to solve your custom network, device, service, or application testing needs. Our experts leverage Ixia’s industry-leading test solutions to assess networks, security, data centers, WiFi, contact centers, and more. Drawing upon the world’s largest, most trusted arsenal of test methodologies, systems, and expertise, Ixia’s Professional Services team delivers the data vital to making decisions, demonstrating value, and meeting customer expectations. We work with CIOs and IT professionals to prove the investments they’re making will meet the performance and security needs of the enterprise today and into the future.